Regional Studies, Missouri, Carmack—Missouri Era, p.
That Sabbath afternoon, the Prophet, Sidney Rigdon, and George W. Robinson walked to Spring Hill to lay out a city.4 Shortly after the Prophet's visit, some of the Saints joined Lyman Wight and began to build the city of Adam-ondi-Ahman. The name was shortened to "Diahman" by its citizens. The cities of Zion in Jackson and Daviess Counties were not completed before the Mormons were driven from Missouri during the winter of 1838 and 1839. Many of the papers represent a convenient summary of helpful information from these secondary sources. Others represent significant use of primary sources and add to the body of knowledge concerning the Mormon experience in Missouri during the 1830s. Additional revelations promised the Saints' righteous descendants a future in the land of Zion (D&C 103:15; 105:27-29; 136:18). Adam-ondi-Ahman "is the place where Adam shall come to visit his people," wrote the Prophet Joseph Smith. It is the place where "the Ancient of Days shall sit, as spoken of by Daniel the Prophet. "5 Clearly the land of Missouri is still in the prophetic future of the Latter-day Saints. The Missouri Symposium in LDS Church History, sponsored by the Department of Church History and Doctrine and the Religious Studies Center, was held in the early spring and summer of 1991. The summer symposium took place on site in Missouri, 18-25 July 1991. Clark V. Johnson, Keith W. Perkins, and Bruce A. Van Orden made arrangements for the trip and on-site presentations. The papers in this publication were selected and edited by Arnold K. Garr and Clark V. Johnson. We thank Charles D. Tate, Jr., and his staff in the BYU Religious Studies Center-Publications Office for their assistance. There was enough blame to go around and plenty of losers. The big loser was Governor Lilburn W. Boggs of Missouri, who became known nationally as the author of an order to exterminate a whole segment of his state's population—the Mormons. Repeated attempts to get Governor Boggs to go to the scene to ascertain the true situation reached deaf ears. He preferred, it seems, to act on rumors and dubious accusations.1 The state of Missouri became tarred with the brushes of prejudice, lawlessness, and brutality for its treatment of the Mormons. The residue of that brutal and lawless era remains a part of Missouri's heritage, although present day Missourians are in no way responsible for the events of the 1830s. The reputations of Generals John B. Clark and Samuel D. Lucas were tarnished by a combination of pettiness, ego, and prejudice during the Mormon War. Their unseemly management of the roles assigned during the skirmish with the Mormons was noised abroad and thus did little to enhance their places in history. Avard's self-serving and unreliable testimony at the preliminary court hearing involving charges against Joseph Smith and his companions in arms has raised questions of what Joseph Smith and Sidney Rigdon knew.2 Similar questions are still raised by writers unsympathetic to The Church of Jesus Christ of Latter-day Saints in modern-day attempts to discredit both Joseph Smith and the Church. Even today the label "Danites" is recklessly pinned on the Church when attempts are made to discredit it by tying it in with foul play of one kind or another. Other Latter-day Saints whose reputations were tainted for their involvement in Missouri affairs include William W. Phelps, Oliver Cowdery, David and John Whitmer, Lyman Johnson, George Hinkle, John Corrill, and Reed Peck. The disunity they caused by their disloyalty to Joseph Smith and the Church remains a murky part of their past. Sidney Rigdon is remembered for his so-called "salt sermon" of 19 June, and for the inflammatory conclusion to his 4 July 1838 Independence Day oration at Far West. It is, however, easier to find tragedy than joy on either side of the monumental eruption caused by the clash of social and religious forces in Missouri during the decade of the 1830's. It was especially costly in lives and property for the great body of Mormons who were the victims of the events and suffered greatly. The question I desire to address now is whether out of the human misery and angry civil war which erupted in Missouri there are any residual benefits from the experience. Did any good thing come out of it? Can we reap the benefit of some wisdom and insight as a result of the tragic events starting in Jackson County and culminating in the exodus to the generous community of Quincy, Illinois? In the general epistle to the Saints dictated by Joseph Smith from Liberty Jail during his six months of incarceration, Joseph was told by revelation and inspiration that "all these things shall give thee experience, and shall be for thy good" (D&C 122:7). Can we find the evidence of such experience and benefits? We can look back on that Missouri experience, moreover, and glean wisdom as we harvest kernels of truth and principles of organization that yet carry the Church and its people forward. A few of these will be mentioned now. A struggle to obtain and administer financing for the Church with its ambitious temple building and costs of administration entangled the brethren in controversy, conflicts of interest, and hard feelings. Living the law of consecration had proved difficult at best, given the imperfection of men and women, and the necessity of living among those not involved with the Church, operating under a free economic society. It was at Far West, Missouri, on 8 July 1838, that the concept of a standing law to finance the Church by having members "pay one-tenth of all [their] interest annually" (D&C 119:4) was revealed through Joseph the Prophet. When the Saints have lived that financial law, the benefits have been great for the Church and its ambitious missionary program, meetinghouse and temple building [p.5] operations, and general financial burdens. Its strength is its utter simplicity. Observers marvel at its success and benefits. The dark days of disunity and competition for position and power which started in Kirtland continued in Missouri. This disunity led to the disfellowshipment and excommunication of some of the leaders. With some of the leading brethren unwilling to support the policies and leadership of Joseph Smith, the fledgling Church had to use a disciplinary structure with as yet unclarified lines of authority and untested procedures for handling dissent, apostasy, conspiracy, and disloyalty. The necessity of survival, when under attack from within and without, led the Church to clarify and create procedures to cleanse itself from internal quarrels and save the growing body of the Saints from extermination, starvation, and the other horrors of mob rule and militia attack. Church leaders firmed up procedures to excommunicate such luminaries as Oliver Cowdery and David Whitmer who, though arguments could be stated for the logic of their viewpoint, had become disloyal to the Church and its prophet.8 These cleansing actions benefitted the Church and perhaps made possible its survival as a unified institution, even with Joseph, Hyrum, and Sidney in prison. Of necessity the Church learned it could only survive as an institution if strong measures were taken to cleanse the inner vessel. In spite of these grave trials in Missouri, the great body of the Saints stayed with the good ship Zion and lived to gather again in Illinois. Many Missouri citizens during this period were guilty of radical and angry response to their fears. Basically these citizens feared being outvoted at the ballot box, squeezed out by the economic exclusivity of the Saints, overwhelmed in sheer numbers by the Saints who were considered to be largely northerners, diluted by what was perceived as an anti-slavery sentiment among the Saints, and having among them Indian sympathizers.9 While acknowledging the challenges the Mormons posed for Missouri citizens, I suspect that those in the country who generally knew what happened to the Mormons condemned the rise of lawlessness, prejudice, and radicalism in Missouri. It seems that there is a general recognition that simple, unabashed hatred of Mormons and the concept that "might makes right" prevailed in Missouri at the time. One of the sad and destructive footnotes of the Missouri melee was the rise of a small element of overzealous, even fanatical members and former members of the Church. It is clear that on the whole the Church's participation in the violent scenes of Missouri was defensive in response to mob action from Missouri citizens and the officially sanctioned militia, which rose only slightly above mob rule. Such radical elements caused a painful sub-chapter to the Missouri plot. We have learned that members of the Church as well as undisciplined Missourians committed acts of disloyalty, extremism, and foolishness. We have fanatical and unbalanced members and former members today as we did in Missouri. They need to be taught and dealt with fairly, but firmly. Today, for example, we have those who would outdo the prophet in "super-religiosity," going far beyond reason and revelation, advocating and teaching extreme doctrines and practices. Some have become tax evaders whose tight logic leads them to break the laws of the state and nation and causes them and their disciples to take a radical and lawless path. As a Church we need to be on the watch for extremism and pride on the part of those who believe they know more than the prophets and who seek to correct our prophets. They lead themselves and others into dangerous paths. Many are sincere, but unteachable and destructive in their behavior. That particular legacy of the Missouri era is one from which we still suffer but of which we have learned to be wary. Our fanatical and radical elements need to be carefully handled. We also learned from Missouri that Church leaders need to keep entirely separate their personal property and Church property. Church money and other property is held by Church officers in a sacred trust for the mission and functions of the Church and its members. The Church needs to have clear lines of authority so that we know who is responsible for particular duties and functions. This will help avoid misunderstanding and confusion. Missouri helped teach us that. Our church disciplinary councils likewise need to be kept fair, merciful, workable and with clearly designated responsibility. Abuse of such process needs to have a way of being checked [p.8] through a process of appeal. The muddy waters of the Missouri era helped us understand and move forward with such clarification of Church government. A more difficult problem still plagues us to some extent—block voting. In most places the Saints are just a fraction of the population and are not looked upon with fear or suspicion at election time. Occasionally, however, and constantly in Utah and a few surrounding states, there is a tendency to fear the Mormon vote or to blame the Mormons for the political climate, specific legislation, and nearly every public and private problem. Joseph Smith understood well the fears of the citizens in those communities where the Saints gathered. He explained that block voting was not the result of Church policy, but rather a natural phenomenon of people voting together because of beliefs which tended to be parallel to one party, one candidate, or one legislative issue. Scrupulous separation in politics and voting and in the administration of government is essential. This is something we learned in part from Missouri, as well as Ohio, Illinois, and our early Utah experience. We must guard against the misuse of the Church organization by the ambitious, and the temptation to abuse the official church machinery. The First Presidency is constantly on guard against such abuse. Great care is taken to distinguish between actions and rights exercised by members as citizens and actions dictated or even suggested by the Church as an institution. There is little doubt that this concern was the greatest fear of Missouri's citizens regarding the Church. Even with that residue of Missouri wisdom, we are constantly accused of dictating policy in Utah. There is little foundation for such accusations, but we do assert the right to have influence in a state in which over 70% of the population are members of the Church. Some would strip the Church of any influence on moral questions and would remove its right to let its position be known on questions involving the moral climate of our communities. We must be wise and communicate clearly our belief in the separation of church and state, yet not be stripped of our power and duty to be a righteous force in our communities. Rumors and accusations making the Church the scapegoat for every ill are read and heard often. This Missouri problem is still with us, yet our experiences of the past have left us with wisdom in confronting this issue. Let me add just a few additional lessons of wisdom coming from the Missouri era. As a people, Missouri has taught us to solve problems, not just point the finger of blame at people within and without the Church. We have learned to keep our economic life separate from our spiritual life in most aspects when living in a diverse community. Early in Missouri we raised fears with our tendency to be a closed economic society within the larger Missouri communities of Jackson, Clay, Ray, Caldwell, and Daviess counties. We caused genuine concern based upon our economic policies and practices. Some of those concerns still persist where we have a large gathering of Saints, but not to such a great extent. We need, however, to be on guard even today against economic boycotting of neighbors whose religions differ from ours. I think it is safe to say we have been more alert since Missouri to individual and institutional preparation for times of tribulation, more committed to our safety and security, and have learned to stand up in legal and proper ways for our rights. We need always [p.10] to state our side of a controversial issue clearly, and accommodate the rights of others, but avoid strident rhetoric. I hope we have learned not to boast of our revelations and spiritual gifts, although sometimes our letters to the editors make us wonder if we have learned that Missouri lesson well enough. Some of our people gave Jackson County residents concern and seeming justification for their unlawful acts against the Saints by boasting that God would give the Saints the properties of Jackson County no matter what those residents did.12 The intervention of God is best left quietly in God's own hands and with trust in his ways. His ways and thoughts are always higher than ours. Missouri was a somewhat tragic period. It was a somewhat lawless period. The constitutions of both Missouri and the United States were trampled by mobs, militia, and governors. Not all Missouri citizens agreed with the lawlessness and hostility. There were living in Missouri during that time many men and women of good will, and certainly the people who live there today are not in any way responsible for the tragic events of the 1830s. We constantly draw inspiration from sections 121, 122 and 123 of the Doctrine and Covenants, extracted from the Joseph Smith epistle dictated in Liberty Jail. Our system of tithing and its administration has kept us on sound ground ever since the Missouri revelation established that inspired means of financing the Church. The orderly procedures and lodging of responsibility for disciplining members, even those in high and holy callings, were refined in the Kirtland/Missouri era as some of our early leaders were caught up in a spirit of disaffection. We have learned to be on the watch for the doctrines and practices of those who would harm the Church and its members through pride, fanaticism, radicalism, poor balance, and poor judgment. Our ability to handle the problems is a matter of experience and wisdom, of which a part is the residue of our Missouri era. Establishing clear lines of authority was another legacy from the period. We have learned to be careful as a Church concerning get-rich-quick schemes. A small element among us seems still to be affected with that injurious mentality. We are wiser than we were in political matters due to our Missouri experience. Block voting is still an accusation heard in the land. Undue influence in government policy is a repeated and tiring accusation today. Finding the balance between showing responsibility and concern on the one hand, and keeping church and state separate on the other, is a problem we are dealing with much more effectively. Our tendency to exclude other citizens in economic practices in Missouri caused some of the fear in the hearts of citizens. We are more careful to separate economic commerce from Church practices today. Patience with legal procedures, addressing problems which arise head-on, being cautious to be prepared for emergencies and safety issues, learning to stand up for our rights in kinder and gentler tones, trying to quell boastfulness and pride, and having greater faith and trust in God are additional Missouri lessons. Yes, "All these things shall give thee experience, and shall be for thy good" Joseph dictated under the inspiration of the Holy Ghost (D&C 122:7). Those lessons and benefits I have mentioned are but a few of the gains resulting from our Missouri experiences. Wisdom comes from such experience and often is the residue of an otherwise tragic period of history. May we study our history, understand its lessons, and use the lessons available to us. Thomas B. Marsh was born in Acton (Middlesex County), Massachusetts on 1 November 1800.1 In 1829, he learned of the Book of Mormon and in 1830 he was baptized after the Church of Jesus Christ had been organized. Thus, Thomas B. Marsh had been with the Church from the beginning. Marsh was very active during the years 1831 to 1837. He was among the early missionaries sent to Missouri in 1831 and later led a group of Saints from Kirtland to Missouri that settled in Jackson County in 1832.2 Marsh was in Clay County when Zion's Camp arrived in 1834. He returned to Kirtland in 1835, was called to the Twelve Apostles, and became the first president of that quorum. Following his call as an apostle, he participated in the missionary work of the Twelve from 1835 to 1836.3 He visited Missouri temporarily in April 1836, but returned to Kirtland in June 1837 to support the Prophet Joseph Smith during the Kirtland apostasy. Marsh, therefore, proved to be a very active supporter of Joseph Smith and was instrumental in the Church's growth and welfare in the early days. His service and dedication greatly benefitted the Church. Marsh's actions sustained the growth of the Church in Missouri, and he made his home there. However, during the final days of the Mormons in Missouri, Marsh severed himself from the Church and remained aloof for over seventeen years. Once in Far West, Joseph learned of the stake reorganization by the apostles. According to Marsh, Joseph approved the action taken. With Joseph Smith now in Far West, a conference of the Church was convened on April 6 and 7, 1838. As part of the business of the conference, Thomas B. Marsh was appointed President pro tem of the Church in Zion, and Brigham Young and David W. Patten were appointed assistant presidents. During the meeting, David W. Patten commented about his respect for the Twelve Apostles: Thomas B. Marsh, Brigham Young, Heber C. Kimball, Orson Hyde, Parley P. Pratt, and Orson Pratt were "men of God, whom he could recommend with cheerfulness and confidence. "14 He also pointed out that other members of the Twelve could not be recommended [p.16] to the Saints. In further proceedings on 12 April 1838, four apostles—William E. McLellin, John Boynton, Luke Johnson, and Lyman Johnson—were excommunicated. After months of concern and labor, the quorum of twelve dwindled to eight members. But, as early as 17 April 1838, a revelation hinted that the fallen apostles would be replaced, and the Lord counseled David Patten to prepare for a mission the following spring "with others, even twelve" (D&C 114:1). When he was but nine years of age, he had a remarkable vision in which he talked with the Father and many of the ancient Prophets face to face, and beheld the Son of God coming in his glory. The revelation also instructed Marsh to remain in Missouri to publish for the Church. He was named printer and publisher of the Elders Journal, which had published its second issue in Kirtland [p.17] during November 1837. Conflicts within the Church had interrupted publication, but after receiving revelation Elder Marsh published volumes three and four at Far West during July and August 1838. The revelations warned Elder Marsh, "Be patient in afflictions, revile not against those that revile. Govern your house in meekness and be steadfast…. Be faithful unto the end" (D&C 31:9, 13). Again the Lord emphasized, "Inasmuch as thou hast abased thyself, thou shalt be exalted…Be thou humble" and "Exalt not yourselves; rebel not against my servant Joseph" (D&C 112:3, 10, 15). The day after Marsh signed the affidavit (25 October 1838), David W. Patten, senior member of the Twelve, was killed at the battle of Crooked River. This left Brigham Young as the senior apostle and Heber C. Kimball next in line. George A. Smith was eventually called to fill the vacancy caused by Marsh's apostasy. 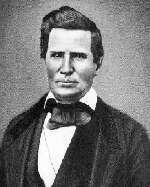 Apostle John Taylor, who was in Far West, described the apostasy of Marsh as a "horrible affair." He testified that the affidavits were not true: "Thomas B. Marsh was unquestionably `instigated by the devil' when he made this statement which has been read in your hearing. "32 Both John Taylor and Wilford Woodruff felt Marsh's actions were not consistent with their knowledge of his character. This letter came at a time after Elder Hyde had been reconciled to the Prophet and to the Church. It is interesting that Marsh had been warned again by a revelation of the folly of his ways, but he persisted nonetheless. I saw David, John, and Jacob Whitmer, and Oliver Cowdery, who had all apostatized. The history of the Church recorded very little concerning the Marsh family because they left the Church so early, and remained in Missouri. The only child mentioned was James G. Marsh, who died at age fourteen. Recent research has enhanced our knowledge of the Marsh family. Thomas B. Marsh's oldest son, Edward B. Marsh, married Louisa Fane, who died in 1849. He later married Minerva Chandler on 22 July 1849.38 Edward B. Marsh and Minerva Chandler had four children. Minerva Chandler Marsh (1831-1876), and daughter, Mary Edward Marsh (1858-1865), are buried in Clark's Chapel Cemetery located 2.5 miles northwest of Booneville in New Franklin, Missouri.39 James Robert Barton Marsh and Elizabeth Sarah Marsh were the two surviving children. Elizabeth Sarah Marsh married William Thomas Powell, whose son, William Edward Powell, married Maud Singleton, who had a family of eight children.40 Sylvia Powell Boutte, a child of this marriage, is the source of this information. She came to the Church Historical Department seeking information about Thomas B. Marsh in 1970, and has since passed away. Little else is known about Marsh's family at this time. It is evident that Marsh blamed pride for his fall from the Church. Clearly, Thomas B. Marsh's accomplishments during the initial years of the Church were monumental. He served as an active missionary, counseled directly with the Prophet Joseph Smith and other Church leaders, and directed the course of the settlement in Missouri as well as the organization of the Church there. Marsh was instrumental in bringing the Quorum of the Twelve into its rightful place as the second governing quorum in the Church. Marsh fell away from the Church when he lost his perspective of Church service and began to feel that he could do no wrong. And evidence shows that, even in apostasy, Marsh was reluctant to leave the Church.